Chicken Pot Pie for the rainy season . 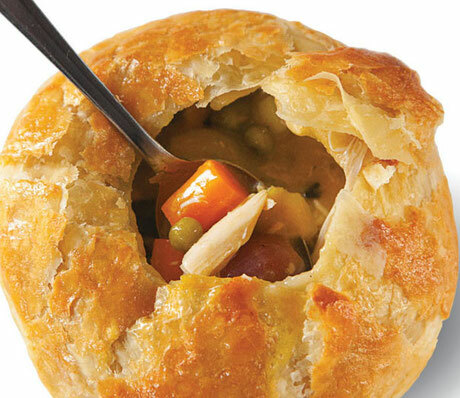 . .
We love chicken pot pie, especially in rainy, damp seasons. Whether you make it with the truffles and truffle oil (an unbelievably luxurious expense), or Cremini mushrooms and use great-quality chicken and seasonal vegetables, it's comforting and delicious. 1. Bring stock, thyme, yellow onions, celery, carrot, chicken, and bay leaf to a boil in an 8-qt. pot. Reduce heat to medium-low for 2 hours. Remove chicken; cool. Discard skin and bones; finely chop meat and place in a bowl. Pour cooking liquid through a fine strainer into a bowl; reserve 4 cups. Reserve remaining stock for another use; set chicken aside. 2. Heat butter in a 4-qt. saucepan over medium-high heat. Add flour; cook until smooth, about 2 minutes. Add 4 cups reserved stock; boil. Reduce heat to medium-low; cook until thickened, about 5 minutes. Add sour cream, Dijon mustard, mushrooms (and truffle oil if using), juice, and salt and pepper; pour over chicken. Add pearl onions, carrots, and peas; toss to combine. 3. Heat oven to 350°. Divide chicken mixture among six 6"-wide x 1 ½"-tall, 14-oz. ramekins or soup vessels. Roll puff pastry until ⅛" thick; cut into six 8" squares or circles. Using a pastry brush, brush rim of each ramekin with egg wash; cover with a pastry square or circle and press lightly to adhere. Brush pastry with egg wash; place on a baking sheet. Bake, brushing pastry with more egg wash halfway through cooking, until golden brown and filling is warmed through, about 35 minutes. Let cool before serving.